Libouton Martine (Bousval, Belgium) on 23 January 2018 in Landscape & Rural and Portfolio. Ils m'impressionnent toujours, et ils tiennent bon ! Une belle scène cinématographique en NB! Fantastic shot and a nice b&w edting. Rencontre du troisième type !! There is a commanding presence of this structure. The B&W adds to the strong feeling. Superbe cadrage ! J'ai aussi joué comme eux sur les blockhaus (pas encore taggés ...) dans mon enfance ! Strong high quality black and white. Such an evident reminder of our wartime past. Your images of this place are always powerful and haunting! J'aime pas les tags moches mais ce graph est très beau. 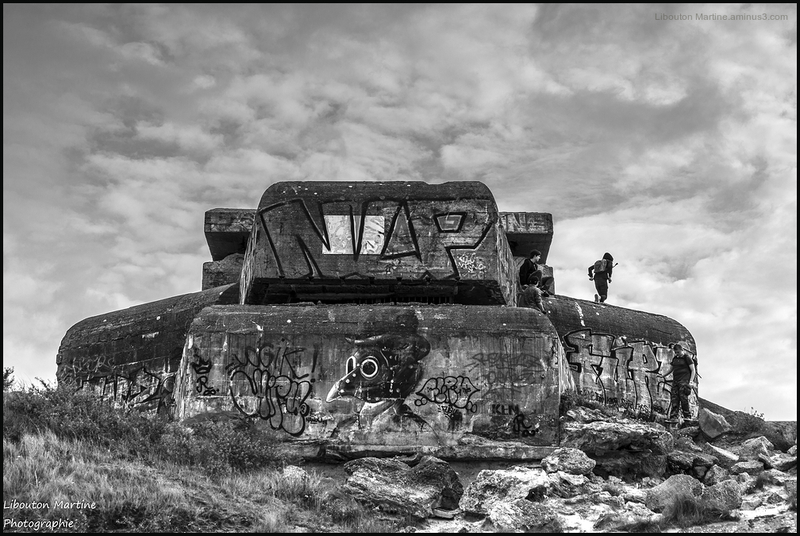 An excellent image of the three explorers and the old bunker. I enjoy the dramatic B&W a lot. C'est que ça va péter ! The is an excellent shot that looks great in black and white. Ton objectif lui a fait peur ! What a frightening structure, and how nicely ridiculed by the graffiti!